Which Sale Option Should I Pursue? What’s My Dental Practice Worth? The Retirement Sale is just what is says it is: the dentist retires and the practice is sold. There generally is very little transition time between the sale and retirement. The seller stays long enough to finish uncompleted cases and moves on to retirement life. Patients receive letters announcing that their “continued care has now been turned over to Dr. Smith, someone who was “hand picke” by their dentist. This is the most common and the least complicated type of sale. It also requires the least amount of advanced planning when compared to other sale options. There are minimal relationship challenges in this transition, because the business relationship between the buyer and seller is brief. It’s been the traditional approach for most dentists for many years. A second practice sale option is the Pre-Retirement Sale, which simply means the practice is sold prior to retirement, sometimes even years before. There are specific benefits to a preretirement sale, and dentists evaluating this type of transition usually have personal requirements and reasons for choosing it. Selling dentists at any career level can consider a preretirement sale. It’s extremely important for preretirement sale agreements to be designed and developed on a case-by-case basis, as the needs of the individuals may widely vary from situation to situation. A structured, preplanned exit strategy for the dentist considering retirement, relocation, or other types of transition is integral to the design of the preretirement sale. This option is popular for the seller-dentist who has the desire to explore career opportunities outside of practicing dentistry. The advantage of selling and continuing to work in the practice (while pursuing other ventures) is one that few business-owners get to enjoy. Knowing that the option to return to private practice exists, these dentists can enjoy the freedom of trying new ventures. The preretirement sale offers a number of other advantages, such as the opportunity to lock in practice value years before retirement and continue working until retirement in an overhead-free and management-free environment. This option also protects the future seller-dentist from possible problems in the future. Often, during the five-year period preceding retirement, the productivity level of many dental practices drops. When this happens, the practice value decreases significantly. Other unforeseen problems, such as death or disability, can obviously have a tremendous effect on practice value. By choosing the preretirement option, this potential downward trend in practice value can be eliminated. Another benefit to the seller-dentist is the opportunity make the entire retirement experience less stressful by planning ahead. The sooner the equity of a practice is converted into a cash-flow stream, the greater the return on investment. In some cases, this provides not only peace of mind, but also tens of thousands of dollars in advance for future retirement investments. In addition, the gradual phase-out plan created by the preretirement sale facilitates a smooth transition for patient transfer. The patients know that they have been turned over to someone who worked side by side with you before you retired. The next practice-sale option is the Deferred Sale. In this situation, the buyer and/or seller are not yet ready to exchange ownership of the practice, but both parties are willing to proceed with a plan for the eventual sale. The deferred sale can prove to be an interesting approach to this common scenario. In this option, all terms and conditions of the arrangements are programmed to occur in advance. There are no items to negotiate at a later date and few questions left unanswered. This preplanning strategy helps prevent any misunderstandings from occuring down the road. Choosing the appropriate practice-sale option will depend upon each dentist’s situation. The multitude of variables include the target retirement date of the dentist, how early the seller began planning, the health status of the seller, whether the seller wants a continued practice option, and the experience level of the purchaser. Dentists with rapidly approaching target-retirement dates have fewer options. It often takes a full year to get everything in order to sell–i.e., valuing the practice, locating candidates, and completing all the necessary paperwork. Those who are one year or less from retirement will most likely leave practice in a retirement scenario, based on the limited amount of time remaining. To have the greatest number of possible options, plan early — at least three-to-five years out. Health problems force many dentists to sell early. At the very least, these dentists should be securing the future sale of their practice through a deferred sale or preretirement sale program. Many dentists savor the idea of selling their practices early and continuing to work in the practice, taking profit out of their business after it’s been sold. Other dentists view this “benefit” with less appeal. For those desiring the continued-practice option, the deferred and preretirement sale approaches are the two on which to focus. Each dentist’s view of selling is different, but three general attitudes prevail. These attitudes vary based on the seller’s age and career stage, as well as financial and health status, and their attitudes about the future of dentistry. What's My Dental Practice Worth? Although I'm not his only client, the amazing amount of attention and diligence he provides sure makes me feel like I am. It was a real pleasure dealing with someone who more than delivers on everything he promises. Dr. Griggs demonstrated integrity and put our interests above his own at all times. Throughout the entire transition process, Dr. Griggs had my best interest at heart while keeping an honest concern for the buyer as well. Transitioning my practice have been a catastrophic event had it not been for Dr. David Griggs. We could not have completed our transition without Dr. Griggs’ guidance. Thank you Dr. Griggs for all of your help and guidance thru the buy-in as well as the buy-out of our practice. I would like to thank Dr. Griggs for handling the transition of my practice in such a professional manner. After working with Dr. Griggs, I now understand why so many doctors contact him Griggs for this very important process. Dr. Griggs offers an absolutely superior service. Without Dr. Griggs expertise, I am certain that my practice sale would have never happened successfully. Dr. Griggs knew all of the innumerable variables that were involved, and was able to address all issues in a very concise and professional manner. Dr. Griggs knowledge, foresight and honesty, instilled confidence in the process to both myself and the buyer. I could not be more pleased with Dr. Griggs efforts in helping me to achieve great results! Dr. Griggs; If you ever need a recommendation or if anyone wants to talk to someone about their experience, I will be happy to provide a positive reference. From my initial conversation to the closing date, Dr. Griggs was there every step of the way. I would encourage anyone considering either of these scenarios to consult with Dr. Griggs before doing anything. We are spreading the word about you and how you helped us to purchase a practice. Thank you Dr. Griggs for your hard work in making the sale of my practice happen so flawlessly. Dr. Griggs made a very difficult time in my life much more tolerable. I interviewed other companies, and I truly made the right decision in using Dr. Griggs’ services. Dr. C. F. Lewis, Jr.
Dr. Griggs -- You were exactly the mediator we needed. For anyone wanting to create a smooth, fair and lasting transition, contacting Dr. David Griggs is the best choice you could make. David did a great job. Dr. Griggs is extremely knowledgeable, fair minded and dedicated. I give him an A+. Through your efforts, you were able to help us all reach a mutually beneficial end result, and we highly recommend your services! You responded to every need with a level of finesse that is refreshing, and your recommendations were invaluable. I could not have foreseen the number of ‘bumps in the road’ that were overcome with the help of Dr. Griggs in reaching a successful outcome on my transition. If professional, expedient, courteous service is your goal in the sale of your practice, you need to look no further than Dr. David Griggs. The work and effort put forth by you was simply incredible. I could not imagine going through that process without your assistance. Dr. Griggs is extremely knowledgeable, fair minded and dedicated. I give him an A+. You had a calming influence on the entire transition process. 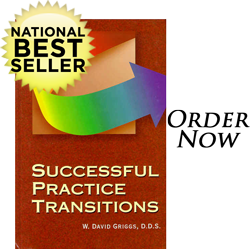 I will highly recommend Dr. Griggs to anyone who is going thru a practice transition. The outcome of my sale was everything I hoped it would be! Dr. Griggs demeanor in the face of seemingly insurmountable obstacles was a great asset. All practices and transitions are different, and your knowledge and professionalism were impeccable. The fact that Dr. Griggs personally experienced a number of transitions himself when he was in private practice makes him uniquely qualified to assist others. The first steps we take as we are considering and making transitions in our professional lives are very critical, for me, Dr. Griggs has been the guide and support I needed. Many, many thanks for your advice and counsel. Thanks to your assistance, I have now doubled my income and eliminated much stress. From the very beginning, your advice was invaluable and on target. I've never been more pleased with a business transaction! You have been persistent, loyal and diligent in all aspects of my working with you. It has been my very good experience to have Dr. David Griggs see me through the retirement sale of my practice. Anyone considering expanding or selling their practice or other transaction should contact Dr Griggs immediately. David, I would like to express my sincere appreciation for the professional and unbiased way you handled the sale of my practice. Had I used your services from the very beginning, I wouldn't have had to undergo the adversary environment that later resulted. Without your help, the sale of my practice would certainly have been a much more traumatic experience for me. I would use Dr Griggs’ services again without hesitation! Dr. Griggs was absolutely essential to the success that I have enjoyed. Dr. Griggs certainly went the extra mile. Your ability, integrity, expert guidance and direction enabled us to make a successful transition. There’s no way the buyer and I would have been able to do this without you. Dr. Griggs’ concern, interest and professional attitude, which was essential for achieving the successful outcome. The purchaser and I were delighted with every aspect of your good work that was done in a very professional manner. You made me very comfortable with what is normally a very uncomfortable area of practice growth and management. Your constant assurance and calm approach throughout the process placed me at ease at all times. Dr. Griggs was able to coordinate our philosophy and to provide a structure so that both parties felt we could move in the right direction. Dr. Griggs handled the sale of my practice in a fair manner where both parties received a fair deal.